These welded flat cars were similar in design to the original FB built in the Webb era but were of a welded design and slightly longer than the originals and coded FBX as they could be bogie exchanged. 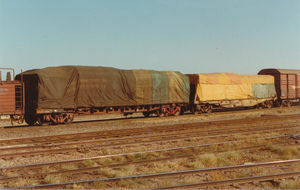 In Feb 1969 wagons 3, 4, 9,10, 12, 19 and 20 were modified by the VR Newport workshops to carry pine board by the addition of a fixed and a moveable bulkhead. This gave them a new classification of FPX. They were recoded to AMFX after September 1979.